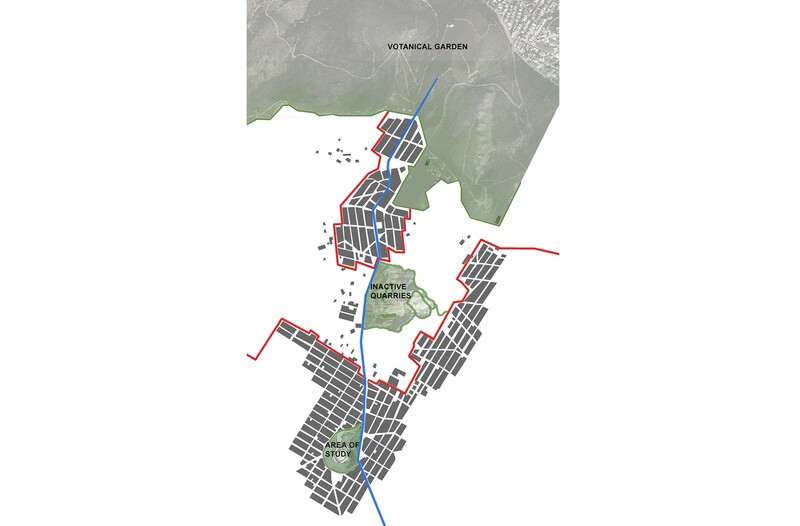 The former cemetery of Nikaia is a residual space on the border between the city and Mount Aigaleo. We consider this degraded and currently unproductive area to be a byproduct of urban development, which is to say a natural component of an evolving city. Simultaneously, we interpret the space as a significant carrier of memory and an integral element of the city. The different manifestations given to this specific space over the years, up until its current usage, make it a point of reference. 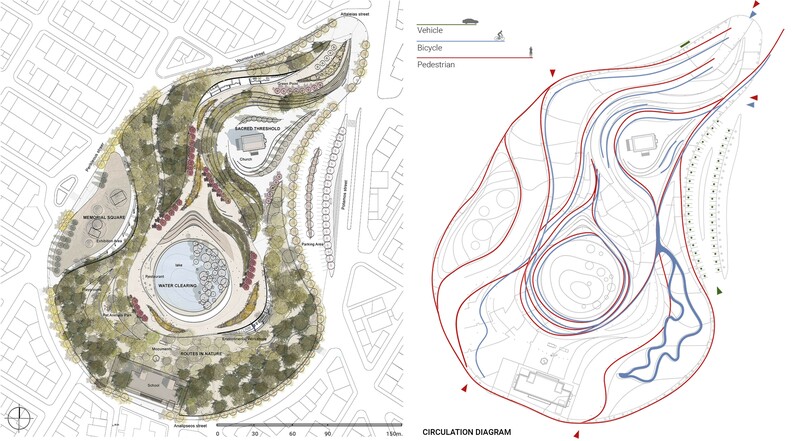 In an attempt to methodologically investigate the issues of re-integration of the study area into the wider network of cultural and local references, it is proposed to record the strategies for recovering the dynamic of the site. - On the first level, we are attempting to activate the hybrid relationship developing between nature and culture. - On the second level, we use collective memory as a mechanism of signification of the landscape. 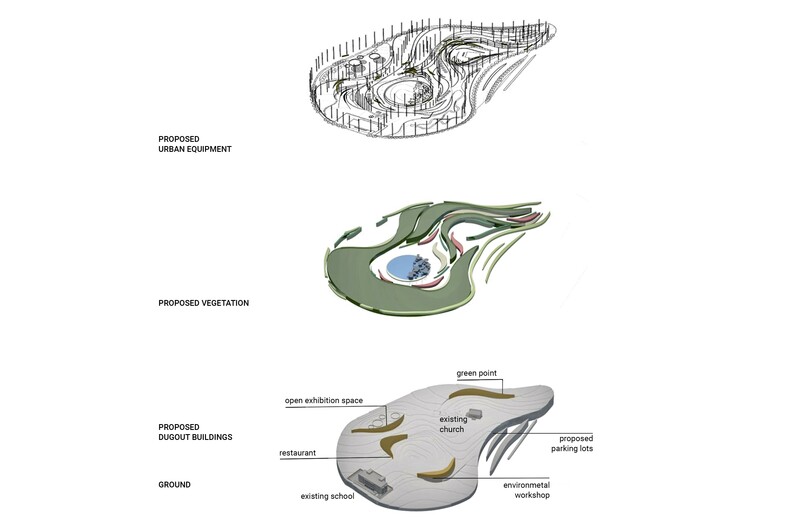 - On the third level, we integrate the design proposal within a framework of sustainability. - On the fourth level, we recommend the landscape surface planning as an open field for various functions. - The first stage would be to form the "sacred threshold". 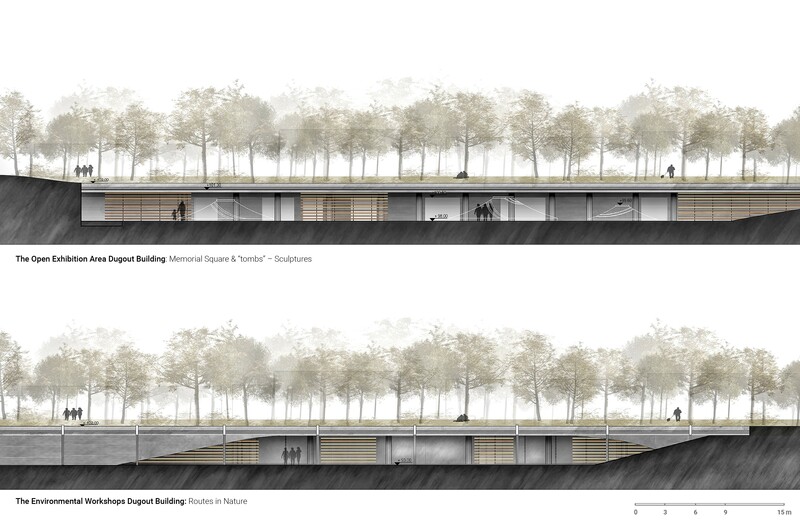 - The second stage would be to construct the space for the "memorial square". - The third stage could be used to shape and enhance the "natural unit". - In the fourth stage, create the routes, the green space, the lake and the restaurant. Planting vegetation is used as a structural compositional tool that provides a structurally valid counterpart to the proposed constructions. 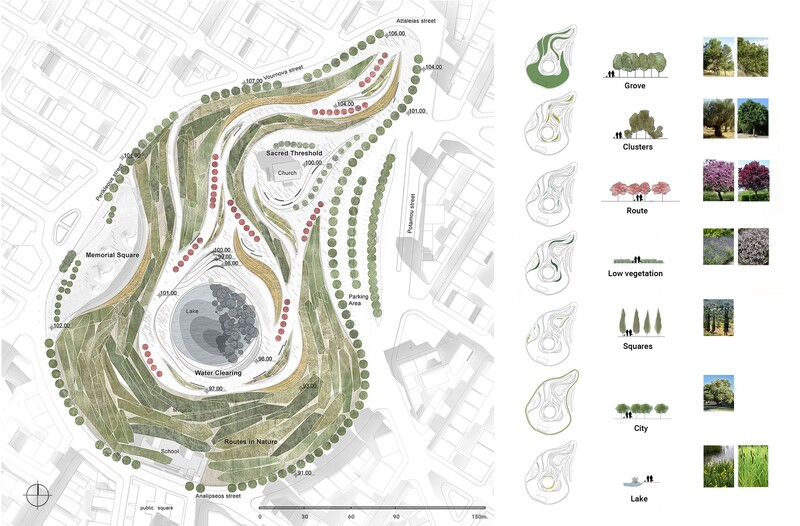 In parallel, the selection of vegetation draws on references to the local flora and is based on the different spatial qualities, aiming to provide aesthetic, environmental, and functional coherence within the space. The flooring materials are used to delineate the main routes, as well as a means to recognize the character of the spatial units. The proposed materials are characterized by their reversibility, ease of reconstruction, and absorbency. In the sacred threshold, part of the memorial square, and the pavements, so as to emphasise their urban character, we have selected “kourasani”, which is a traditional kind of building mortar. In the tomb square we propose using gravel. On the routes of the water clearing unit, we have chosen to use plant-based “stabilizer.” In the playground and the domesticated animal park we recommend trodden earth. On the planting surfaces, we will use horticultural soil. In the car park we will extend the tarmac used on the road. Based on the soil and microbiological analysis of the former cemetery, a strong presence of heavy metals and microorganisms was found, entirely attributable to the use of the specific area. It is clear that the long-term use of the space has influenced the qualitative composition of the land, given the input of inorganic and microbial loads. The artificial lake will need to be constructed by using a geomembrane to contain its water so that it does not infiltrate the water table. A hydrogeological study is therefore considered imperative, accompanied by an exploratory drilling as a first step so as to determine the thickness of the unsaturated zone, the depth of the water table, and the level of the underground water of the area. At the second stage, the exploratory drilling could be expanded and become productive if the results of the water supply are positive, and it could be used for the needs of the project, such as for irrigating the green spaces and renewing the water in the artificial lake. 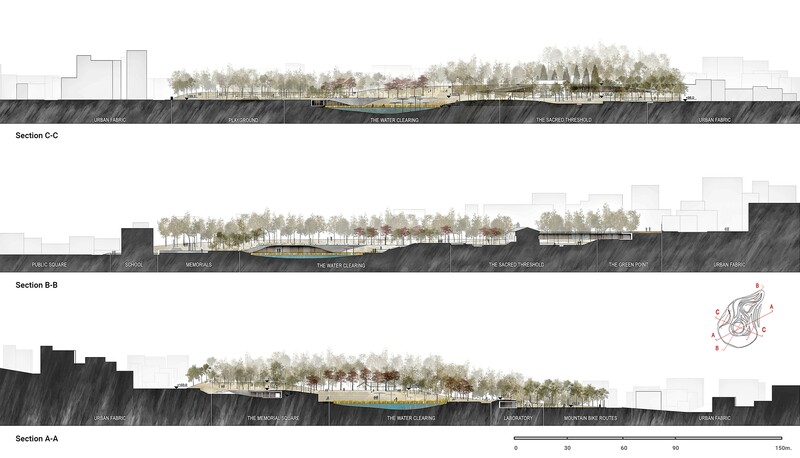 The lake will create an ideal space for the development of fauna which may contaminate the surface water of the lake. The rhizobacterial method may be used to clean and reuse this water, as it will be free from chemical elements such as phosphates, ammonia, nitrates and organic microorganisms. In addition, it is proposed the placement of tall photovoltaic metal sculptural elements in the lake, to collect solar radiation in specially formed spaces where the accumulators will be placed. This will achieve the coverage of the lighting needs of the three enclosed spaces of the park (restaurant, green point, and environmental workshop). In addition, part of the accumulated energy will be used to recycle the lake water. Lighting is a key tool in the principles of park design. We propose high output and low energy consumption light bulbs (LEDs, fluorescent or halide metal etc), so as to ensure the most economical function, while minimizing cost and maintenance needs. We have selected types of lighting to mark different spatial qualities.